Wow. The instructions are so dense with unnecessary text, and eventually tell you to first uninstall any previous version, which necessitates removing half-a-dozen files from the Macintosh library manually. Confused? Of course you are! You’re not supposed to have to go mucking around in the Macintosh Library unless you’re a developer or you’re trying to recover from a poorly written application that has screwed up your settings at a very base level. Let's be clear. You should NEVER have to go to the Library for an uninstall. Of course you can watch a video on how to do this. By the way, the video is a WMV, Windows Movie file – guess it would be too awful for MSFT to provide a system native Quicktime for the Macintosh-specific instructions. This is starting to feel like it was written by someone who wanted the user to break their Macintosh. And the video conflicts with the written instructions on the web page which show many more files to delete than the video does. Did I mention that telling people to go into the Macintosh library and manipulate files is like telling Grandma to wet solder a circuit board – just not supposed to happen. Really? Really? Are you trying to be a self-parody of a clueless conglomerate with lazy developers? I’m no longer defending Microsoft when people accuse them of not “getting the Macintosh.” I’ve done so for many years, saying how many people in the Mac business units really do know and enjoy the Mac. But this has made me so embarrassed to have been involved with developing multiple applications, both on the Microsoft Office team and at eBay, that were dependent on this tech*. By the way. I stand by my prior statements that there are hundreds of Microsoft employees who appreciate, understand, and like the Mac. They live and die by the quality of work they do in making applications like PowerPoint really useful for those trying to co-exist with a predominately Windows business world. I have nothing but respect for those individuals. Not so much for the Silverlight team. * While developing the Web Companion for PowerPoint at Microsoft, I was the PM for the team that used Silverlight to render the slide show in a window that would scale the slide interactively when the window was resized. 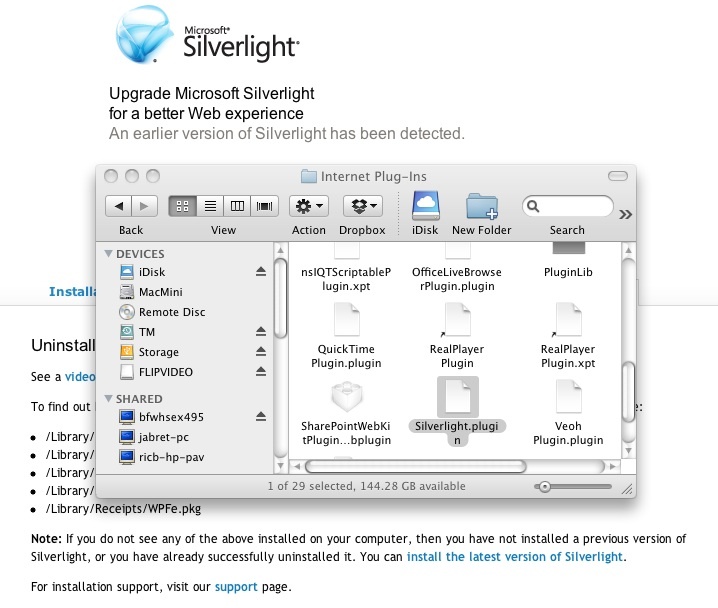 Without Silverlight installed the image would be a static fixed size. When I joined eBay I took over the Simple Lister project, a stand-alone Silverlight application that experimented with creating user product listings in under a minute. This entry was posted in Business, Design, Geeking around, Software, Technology, Uncategorized. Bookmark the permalink.